In the wake of the latest oil company profit report showing much higher earnings, President Bush on Friday rejected calls in Congress for a tax on oil company profits, saying the industry should reinvest its recent windfalls in finding and producing more energy. "The temptation in Washington is to tax everything," Mr. Bush said in an exchange with reporters in the White House Rose Garden. Rather than for the government to reap the benefit from oil company profits driven by the recent surge in global oil prices, he said, "The answer is for there to be strong re-investment." "These oil prices are a wakeup call," Mr. Bush said. "We're dependent on oil. We need to get off oil." With gasoline topping $3 a gallon in many areas, Mr. Bush said energy companies should use their increased cash flows to build more natural gas pipelines, expand refineries, explore "in environmentally friendly ways" and invest in renewable sources of energy. "That's what the American people expect. They also expect to be treated fairly at the pump," he said. Mr. Bush's exchange comes in the wake of some congressional Republicans and Democrats in both the House and Senate promising to roll back billions of dollars in tax breaks for major oil companies. House Republicans refused to go along with a proposal that called on House members to accept a Senate-passed repeal of $5 billion worth of oil industry tax breaks. They are the subject of intense negotiations between the House and Senate on a broad tax bill. A resolution urging House negotiators to accept the Senate tax proposals failed 232-190, with only two Republicans voting for it. Meanwhile, a major U.S. oil company has reported soaring first-quarter profits for the third time in three days, buttressed by near-record gasoline and oil prices. The San Ramon, Calif.-based company's net income, reported Friday, translated into $1.80 per share, two cents above the average estimate among analysts polled by Thomson Financial. That compared with a profit of $2.7 billion, or $1.28 per share, in the same January-March period last year. "Higher earnings in the first quarter were primarily driven by the performance of our upstream business," chairman and CEO Dave O'Reilly said in a statement. "Prices for crude oil and natural gas were strong during the period." Chevron released its results after two of its biggest rivals, ConocoPhillips and Exxon Mobil Corp., had already provoked public outrage with similarly large first-quarter profits. Combined, the three oil companies earned $15.7 billion during the three months of the year. In a hastily arranged news conference, Mr. Bush also criticized efforts to sing the national anthem in Spanish. "I think the national anthem ought to be sung in English," he said. He also rejected calls in Congress to abolish the Federal Emergency Management Agency. "The lessons of Katrina are important. 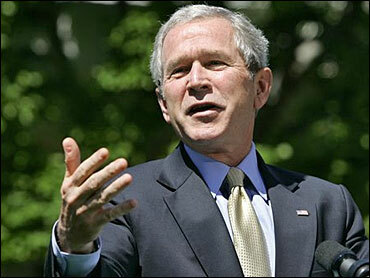 We've learned a lot here at the federal level," Mr. Bush said. "We're much more ready this time than we were the last time." Mr. Bush also addressed international issues. He criticized efforts by the Sudanese government to thwart efforts by the U.N. and other multinational organizations to take a firmer control of fighting atrocities in the Darfur region. "My message to them is we expect there to be full compliance with the international desire for there to be peace in the Darfur region," he said. And, the president said "the world is united and concerned" about Iran's suspected desire to build nuclear weapons and that he will work with other countries to achieve a diplomatic solution to the crisis. But the president sidestepped a question on whether recent staff changes at the White House could help reverse his presidency's slump in the polls. "I think it's necessary to continue doing — achieving results for the American people. We've got big challenges for this country, and I've got a strategy to deal with them," Mr. Bush said.